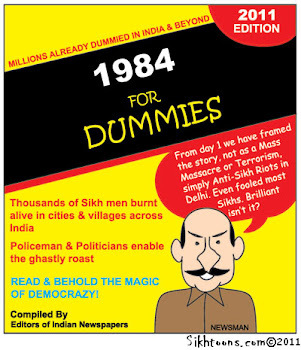 THE ROAD TO KHALISTAN: "FIGHTING INTOLERANCE SINCE 1699"
This brought a big smile to my face. I noticed that they even "ji'ed" Guru Gobind Singh ji. This paper has class! 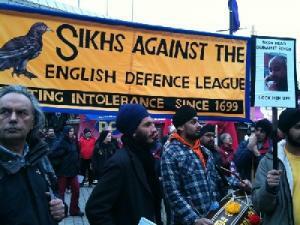 A delegation of Sikhs marched proudly joining a big rally against the English Defence League (EDL) held in Luton. They played the Dhol, a Punjabi war drum, as they entered the rally carrying a banner that read ‘Sikhs Against the English Defence League – Fighting Intolerance since 1699’, a reference to the establishment of martial Sikhism by the 10th Guru of the Sikhs, Guru Gobind Singh Ji. They were greeted with cheers by more than two thousand demonstrators gathered in the Park Square, in the centre of Luton, who gave the marching Sikhs a great applause. This comes as a great blow to the English Defence League (EDL) as they had claimed that they are getting support from many Sikhs. The demonstration by ‘Sikhs Against the EDL’ shows otherwise. The Sikh protesters shouted slogans against Guramit Singh, one of the self-styled EDL leaders from Sikh background and called him a traitor. They claimed that he had brought shame to the Sikh community and should be locked up due to some of his recent speeches. Varinder Singh went on to condemn Guramit Singh (ethnic spokesperson for the EDL) and other racist traitors of Sikh origin joining EDL and expressed that these individuals should be held accountable. 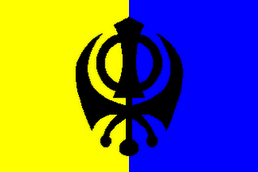 Sikh and Hindu organisations, including many Sikh Student Societies, as well as many prominent individuals in this country. Salvinder Singh Dhillon from the Indian Workers Association pointed out that the rally was being attended by all communities was a proof that they all stand shoulder to shoulder against promotion of racism and fascism. The rally was organized by Unite Against Fascism(UAF), a broad based organisation supported by numerous individuals and organizations including trade unions and members of parliament. Various speakers expressed their opposition to EDL and the racist British National Party( BNP). There was also a further protest in the Bury Park, near the Mosque, organized by the Muslim community and attended by nearly two thousand people.